Marketers, according to Jonathan Crossfield, are often the worst judges of their own marketing. When it comes to content writing, they tend to prioritize the wrong things (clicks) and undervalue the kinds of work that help their content truly shine (namely, editing). Through his work, Jonathan has learned to recognize the kind of content writing that activates readers versus the kind that turns them off—lessons that informed the all-digital reboot of CCO Magazine, where Jonathan serves as Editor. He champions an approach to content creation that prioritizes changing audience behavior and a big-picture look at content ecosystems rather than fixating on things like view counts. In this episode, Jonathan explores what marketers too often get wrong about the purpose of content marketing. You’ll also hear a breakdown of the distinct roles editors, writers, and proofreaders play on content teams and why each one is essential, despite how often they are conflated or dismissed altogether. The danger of chasing “silver bullets” in content writing. The crucial (and overlooked) differences between editor and writer, and editor and proofreader. Why and how CCO Magazine transitioned from being a print to a digital publication. Why undervaluing editors and editing undermines the value of your content—and how your audience can tell. Stay connected with your email subscribers using Emma. Explore the all-digital April 2019 issue of CCO Magazine. What was the first book that made the biggest impression on you? Revenge of the Cybermen, one of the very first Doctor Who novelizations, inspired Jonathan to become a writer! What author has made the biggest impression on you? Jonathan enjoys the work of George Orwell, especially his writing on the craft of writing, which Jonathan recommends to all content marketers. What popular book have you had trouble getting into? While revisiting the classics, Jonathan says Jane Austen’s prose unfortunately left him cold. Anna: Hey everyone. Welcome to the Content Experience Show podcast. This is Anna Hrach from Convince & Convert. Now, my favorite co-host Randy Frisch from Uberflip won't be joining us today, but that's okay, because we still have an amazing show for you. Now, our guest today is actually somebody who we've been trying to have on the show for a long time. We actually have the amazing Jonathan Crossfield. 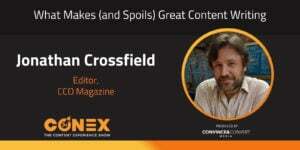 He talks a lot about being the editor for Content Marketing Institute's Chief Content Officer magazine, and we also get into a whole bunch of word nerd conversations including our stance on the ever-controversial Oxford comma. So to hear what we have to say about it though, you're going to have to stick around to the end. In the meantime though, you should definitely listen because there are just a ton of amazing takeaways that Jonathan provides, such as the entire process that went into relaunching Chief Content Officer from being a printed publication to an online-only presence. Plus how editors, writers, and proofreaders are actually three completely separate jobs. But why each one of them should have a spot on your team. So without further ado, let's go ahead and bring Jonathon in and hear what he has to say. Hey Jonathan, thank you so much for joining me today. I am really excited to talk to you because this has been months literally in the making. Actually like almost like a year in the making. I mean, practically coming up on a year. That's an exaggeration. Jonathan: I think you first invited me when we met at Content Marketing World. So yes, it would be. So thank you for inviting me then. And thank you for remembering me now. Anna: You know, and we have to explain a little bit beforehand maybe. So Jonathan, you and I met at Content Marketing World last year and it's funny because the tables are turned now because then you were interviewing me and now I get to interview you and there's so many topics I'm so excited to dig into. But before we do, actually, would you mind just telling everybody a little bit about yourself? Jonathan: Yes. Well, as you just said, I first interviewed you at Content Marketing World in my capacity as the editor of CCO magazine, which is the magazine published by the Content Marketing Institute. And I took over that role just over a year ago from the previous editor, but I'd previously been writing for the magazine since the very first issue. Anna: Oh, I didn't know that. Jonathan: Far too long ago for me too, to remember. Anna: The very first one. Jonathan: Yeah. Which I think was 2010 or I think it actually came out in 2011, but yeah, so it's coming up, yeah, nearly a decade. So that was one of the reasons why when Claire, the previous editor moved on, she put me forward as the editor. And that's been a learning experience. Other than that, obviously, you don't just start out as a editor of a magazine. Prior to that, I've been a content marketing consultant and writer long before I even knew what content marketing was, which I think is how a lot of us start. We're just doing the company blogs and the other stuff that we just do as marketing and then we hear this thing is that, "Actually what you're doing is this." Anna: Or just driven by pure rage of like, "That's not how you do it". Jonathan: Oh, yes. Oh, yes. Anna: Yes. Those days. Jonathan: So I got into the industry in 2007, after I was made redundant from a previous career. And because I trained as a journalist, I trained as a writer decades ago. It's was, that was my opportunity to get back in and actually do something with words again instead of spreadsheets. And it was just the right time in 2007, 2008, when blogging is taking off and social media is taking off and it was just that explosion. And of course, a couple of years later I hear about Joe and the CMI and here we are. Now I'm a freelance consultant here in Australia. Anna: That's it. By the way, you also, I think, I'm pretty sure you get the award for guests for this distance away. I mean we are separated by 16 hours, where there's a 16 hour difference right now it's morning, your time, afternoon, my time. But then even also distance too. So thank God for telecommunications. I mean it's amazing. It makes life better. But so you have been with CCO from literally the beginning. You've seen it grow and evolve and change and now from what I understand, you've given me a bit of a sneak preview. There are some bigger evolutions and changes happening, as well. Jonathan: Yes. Well, at the second half of last year we took the decision to relaunch the magazine and we go fully digital for various reasons, but one of the big ones for me as the editor because I'm focused, I couldn't care less about the company issues or decisions. I'm more about what's good for the content. It was in print, there's so much that you can't showcase effectively, particularly in the last few years when you've begun talking about things like podcasts more and all these other mediums like what we're doing now and then you're writing about it on a printed page. It's good. It was never bad. I'm not saying it was ever a bad magazine. Of course it wasn't. But it's like- Anna: It was beautifully published. I mean it was super high quality. It was a beautiful print magazine. Jonathan: I like you. But, there's so much more we could do and I think it was a good time to sort of reevaluate what it should be for the next few years. What's the next stage or volume or era of CCO to be like. And so there was a lot of planning at the end of last year about what that would look like because one of the things we, from the outset, all agreed that it shouldn't do, if we just like saying, okay, we're gonna take our magazine and go digital. And we know that's been a common story with a lot of print magazines who eventually decided to shut the doors and go digital instead. And what they've effectively done is just like whack the content online and it's like, you're just another blog now, you know? And so we really didn't want to do that. What for the other reason, then CMI's already got a blog, it was like we'd be cannibalizing ourselves if we just did the same thing over here as is already over there and trying to link between them somehow. Make that work as an experience because the experience of a blog versus the experience of a magazine is of course, very, very different. A blog is very much a wham, bam, thank you ma'am. You follow the link, you go through, you read, you click back, and you go onto the next thing, particularly when it's often driven by social and all the rest of it. The magazine is something that's particularly in print was something that you might have sat on your bedside table and so you are literally dipping in and out of the same batch of content until either you're done or whatever is interesting in it you've completed. So we wanted to retain that stickiness of the magazine versus the more ephemeral nature of a blog, as well as showcase and using more rich media and be able to do all these other digital assets as well. So yeah, there's been a lot of thought and planning into what, how that will work, a few experiments, some didn't work and some did work and now we're about two weeks before it goes live. When this recording goes out, it should be live. So, we're at that really interesting stage now where you're probably able to see, it now and I'm hoping that everything I've just said, everyone listening to this agrees with. Anna: I love that whole perspective that you had about how you really didn't want it to be just another website collection of curated articles and content and also you didn't want to cannibalize CMI's blog and content because they also are producing content separately. You wanted to retain this CCO entity and the feel and the look. So how did you ultimately get everybody on the same page? If you don't mind me asking about, not even what the end result was, but how did you actually come to this conclusion internally editorially? Like what kind of conversations happened? Was there any work shopping? Was it just a lot of sort of researching? How did that work? Jonathan: It began with a lot of meetings of just in the beginning, everyone saying how they interpreted the move and then trying to reach consensus because you can put out a a goal of, okay, we're going to take the magazine and go digital next year. And everyone can interpret that very, very differently. Some people might go, oh, okay, it will be simple. Let's do it this way. And it ends up being a blog, somebody, people might go, well, I want to do this now. And so you do need to have a ... it's not about arguing with each other, it's literally about, well, what does that mean? And discussing what those nuances are and discussing, well if we do this, do we lose something over here and how do we counter that? So if someone was to raise an idea and say, well we can do this for example, when we're looking at existing templates that we could use for example, that's would help us to do it more efficiently based on what the technology we already had available to ourselves. Because we also didn't want to ... CMI obviously uses a lot of various tools all ready to publish what it already does. We didn't want to have to go out and reinvent the wheel either, so if we've already got these things, try and find a way of using the same ones. So there was a bit of that and compromise. But always saying, well if we do do that, do we lose something over there and what do we then do instead of or something. One of the things that I was very keen to ensure that subscribers didn't see any or didn't get any sense of losing something in the change, if anything that they were gaining something in the change. So some people love print. I'm old, so I adore print still. I tried to do the ebook thing. It didn't take. So I still have book shape cases all around the house and I still buy the print version of the magazine even though I know a digital one is available. Just [crosstalk 00:11:23] tactile nature. So I'm aware that if this was happening to me, for example, that I might feel like, oh, this is now somehow lesser than, because I'm losing that experience. So that needs to be compensated. That needs to be, well, yeah, sure it's different, but it's better because of this, this and this reason. So there was a lot of discussion about, well how do we make that better? How do we value add to that? What do we have already that we can use to create new value to replace that, such as, for example, the amount of audio that would naturally be captured in the creation of an issue through performing interviews and so on. Usually that would be as far as it would go, it would go to the transcriber and then the audio would sit on someone's hard drive until the end of time. That we decided, well, we've got all of that rich media there as well that with a bit of editing, depending on who did the interviewing and how they performed it at the time, but with a bit of editing and a bit of polish, you can use that as embedded media, as rich media, we can have downloadable audio or podcast or whatever. So we started trying to look for those kinds of opportunities with what we already had. To say, well now this gives us the opportunity to do this and not just think in that linear, well, we've always done articles that were formatted this way in the magazine. Therefore, we just carry the same type of content across. It was like, we need to rethink the contents completely. Anna: Nice. I love that. No, thank you so much for walking through the process and because there are a lot of tough conversations that have to happen in order to make something like this transition to the online world, but like you said, without making people feel like they're missing anything or make people feel like you're just sort of slapping print content online. So Jonathan, we are going to take a quick break but I want to talk a little bit more about CCO magazine and then also get into some nitty gritty writing editing topics with you because we can do that because we are both massive content nerds. I think we can both agree on that, yeah? So everybody stay with us, we are going to take a quick break and hear from a sponsor and then we will be right back with Jonathan. Jay: Hi Friends. 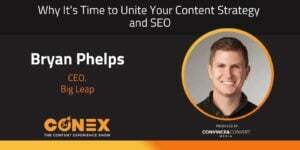 This is Jay Baer from Convince & Convert reminding you that this show, the Conex Show podcast is brought to you by Uberflip, the number one content experience platform. Do you ever wonder how content experience affects your marketing results? Well, you can find out in the first ever Content Experience Report where UberFlip uncovers eight data science backed insights to boost your content engagement and your conversions. It's a killer report and you do not want to miss it. Get your free copy right now at uberflip.com/conexshowreport. That's uberflip.com/conexshowreport. And the show is also brought to you by our team at Convince & Convert Consulting. If you've got a terrific content marketing program but you want to take it to the very next level, we can help, Convince & Convert works with the world's most iconic brands to increase the effectiveness of their content marketing, social media marketing, digital marketing and word of mouth marketing. Find us at ConvinceAndConvert.com Anna: Hey everybody, we are here with Jonathan and we were just chatting about some of the big updates with CCO magazine. So Jonathan, I have one more question for you around the magazine because have been with the magazine writing for it since the beginning. Now, obviously you're the editor of CCO magazine, so you have seen all of the trends, all of the topics of conversation come through. You've seen, I guess you've been at the forefront of all of these great conversations around content. What is something that people aren't talking about today but they really should be? Jonathan: To be. Whoa. Anna: Not to throw a curve ball at you, yeah. Jonathan: To be sort of honest, I feel like it may even be the same things that should have been discussed, but worked back then. The topics that ... they're beginning to happen now, but the topics that I find don't get enough air still, are the same ones that when I first started this, like 2007, in this industry, were the same ones I was still battling against then, which is the algorithm is not everything. There still needs to be room for creativity. There still needs to be room for the art, not just the science. And I think that's just still brushed off a lot. I come across, working with various clients, and I still have those conversations about okay, planning an editorial calendar and at the beginning of the editorial calendar they just set a whole load, basically SEO formulas over everything, and it's like, well no, no, no. That's not where you start. That's where you end, where to take the great content that you produced and then find out how to make it more discoverable. Don't start with that because what we can hit those metrics really easily, but the content's just going to be rubbish. I think there's still a lot of that kind of trying to find the silver bullet in content or trying to find those formulas and then just applying that and somehow thinking that this is how you create quality content and overlooking the nuances of content production that come with someone knowing how to write to a higher standard, for example. Or someone having more original ideas and original ideas because their original often don't have the same keyword value as something that's already been pushed a million times. So it's like, you know, okay, what's the keyword headline for that? I don't know. Because it's an original idea. That needs to be ... I'm not saying you throw all that stuff out. There needs to be more understanding of how those two things should work together and the formulaic side of the discussion shouldn't keep ... I still think this still happens a lot. It shouldn't be shutting out those other conversations. Anna: I, you know, it's funny as coming from a writer background and a brand copywriting background specifically, I struggle with that all the time too, where it's so hard to get people to see that balance where yes, machines and algorithms are finding our content, but it's people that are reading it and at the end of the day, if people don't find it valuable, if they don't stick around, if they don't want it, algorithms pick that up. So it's, you know, it's like we have to actually write, like you said, have room for the art, have room for the people in there, have room for the storytelling. Because if people don't want that content at the end of the day, it doesn't matter how finable it is, they're just going to ditch it and then it doesn't even matter and it's all for naught. Jonathan: Absolutely. 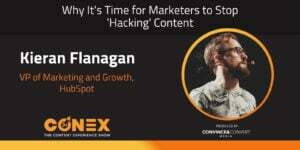 Because one of my big soapboxes has been -- and I have many soapboxes, but one of my biggest ones is the whole point of content marketing is not getting people to read your content, the whole point of content marketing is getting them to do something as a result of reading your content or consuming content. If you're focusing on just getting them to read your content, then you're measuring clicks, you're measuring engagement metrics and that kind of stuff, but you want them to have read to the end of your ebook or your white paper or watch to the end of the video and as a result of what you've said and how persuasive you've been, go, I need to do this next. Even if it's I need to go and read that next piece of content or we ... or I need to go and research that product, or I need to go and do this in my life to be ... You're supposed to be ... content marketing at one level is about the transmission of idea. You're trying to get across something into someone else's head, to change their attitude towards something or motivate them to do something because that's what marketers do. And I think for a lot of content there's still this perception that it's all about the clicks. We know we've driven the traffic and somehow it'll find its way the rest of the way. And it's like, yeah, you've got no way of knowing whether they read past the first paragraph before going click, oh, this is boring me. And we've all seen content like that. So I think, yeah, it's just understanding what that content is there to achieve and measuring that. Anna: Which is interesting too because a lot of people would kind of lump that more into performance marketing. But I have a tendency to always fall back on user experience and content strategy and content experience. Because to me, if you're providing this amazing user experience and you're providing what they need and you're providing things that help them, it really is about the user and the experience. And I think that's oftentimes forgotten about with the content. Going back to our conversation about creating for users and not algorithms. Jonathan: Absolutely. And from the user's perspective, they're not going in going, oh, this is a piece of performance marketing, this is a piece of content marketing, this is a piece of social media marketing- Anna: Oh, look at how great their channel strategy is. Right. Jonathan: They don't care. As far as they're concerned it's the same conversation. If it's all coming from the same place, from the same brand or whatever, it's the same conversation and it should to them, feel joined up. It should be achieving the same journey. I think we sometimes, while it's important to at one level, to have that depth of understanding, to know these different terms and purposes and ways that we use content, the strategic stuff behind it, we shouldn't allow, we shouldn't let that get in the way of the customer's view. And that's something that constantly comes up. It's like, no, no, no, this content is supposed to work this way, but like, yeah, but the customer doesn't care or the reader doesn't care. They're just trying to find the answer to this question that they've searched for or they're trying to find a piece of information and then from that hopefully do the next thing. Does it achieve that? That's your number one goal. Anna: I think it's interesting too. And it's funny, we've had some similar conversations before. Randy and I have talked about this where it's kind of funny that when marketers go to market things, they forget what it's ever been like to be a customer. Like we've like never once been a consumer or a customer of anything and we just think about like, okay business goals, business goals, clicks, clicks, but we don't ever think about like maybe I just need that piece of information and I don't have to do anything else, but I might come back and then do something else. Like they just, we forget what it's ever like to be a human. Jonathan: That's right. Anna: And I lump myself in there too. Jonathan: We're all guilty of it and it's something we just have to be self aware of. It's the same being a writer for example, writers are often the worst people to edit their own content. I think marketers are the worst people to assess their own ... because you need to take that step back and look at what you're doing and go, yeah, but if I was the consumer, would I respond the way that you were hoping I would? This is the hard bit, be honest with ourselves about that answer because we want it to succeed and so we go, I think I would, but that's you going in with the pre knowledge of you what that to happen. It's like, yeah, come on. Be honest. Would you really subscribe to this content hub that is basically wall-to-wall advertising in another form or would you … which is again, more common than it should be, or would you try to follow your own way through the internet to find the solutions to the problems or inspiration, what it is your personal goal is in a kind of more autonomous way and I think that's something that we keep forgetting. Anna: I agree. And also, not to take a hard shift in topics, but you actually brought up something that I wanted to touch on as well, which is, so you are both a writer and an editor and you are obviously editor of CCO magazine today and you've also been a writer for them and continue to write for them. A lot of people don't quite understand the difference between writer and editor and do you still find that, at least that's my perception. Do you still find that that's really true, that people kind of lump them into one category and they're like, oh, writer, editor, proofreader, also included in there? Jonathan: Yes, and I think, basically the fall of civilization stems from this. I have opinions. Anna: As the tarot cards have revealed, this'll be the fall of civilization, without getting ... yeah. Jonathan: I think at the core of that question, which I agree with, I think people do underestimate the differences between those roles. Is that the trivialization of writing as an activity in the first place. Is there's still that idea that I have a high school education, I can write, therefore I can write a white paper and we've all encountered that kind of content where it's the professional writers amongst us and the copywriters, the content writers, whoever, will read it and go, you can write small "w" but can you write big "w" and there's a big difference between the two. Editing is the same thing. Editing is that overarching view, not just of that single piece of content but all the content within the ecosystem it's going to exist with, whether it's the entire newspaper, or the entire magazine, or the entire contents hop and making sure that everything works together in is consistent and achieves a common purpose, whatever that may be, but also is that ... like we were just talking about, as a marketer being able to step back and review what you're doing and saying is that going to work? The editor is doing that for the writer, which is why I love working with a good editor because they will always make my writing better. They provide that sanity check. They will not let you get away with that thing in paragraph three that you sort of knew was not really going to work, but you are hoping it was going to be good enough. They're the ones that will come back and say, do you have a source for that claim? And you go, ooh, maybe I ought to. So that kind of interrogation of your content you lift it to the next level. I cannot say enough, basically. And proofreading is something else again. Anna: Yeah, totally. And this is actually something that that I've talked about in talks before about how we have this tendency, especially within anything to do with writing and editing. We create these superhuman writers or these superhuman positions where it's like we want them to write and then also edit and then also proofread. But, a good editor, like you mentioned, should be able to very clearly hold a mirror up to the writer and say, this is the story that you're telling, here's how it can be better. Or is this the story you really want to tell versus a proofreader is going to line edit things and look for things that a writer would not catch because they are reading it in their own head and their own voice and how those three are so drastically different, as you talked about, and also how essential they are to good storytelling as even CCO has. Jonathan: Oh, it is, and I think a lot of people underestimate just how important the proofreading role is into that. On one level it is okay, they're catching the typos and they're making sure the use of the Oxford comma is consistent or not. I'm anti Oxford comma. Anna: I am too! Jonathan: Oh, my goodness. I high five the screen. Anna: I'm sure people just deleted the recording right now. They're like delete the podcast. Jonathan: Well they'll be happy to know that CCO is pro Oxford comma, so I've had to swallow some things there. So there is on that level, they're making sure that the letters on the page function the way they're supposed to. The grammar is correct and they catch things like sourcing and all the rest of it. But on another level, they ensure that the content doesn't trip up the reader, by which, I mean, the experience of reading content, the moment you notice a mistake or the moment you have to read a sentence twice because you weren't clear on the meaning the first time because it rambled on for five lines and had three parentheses in it, is the moment you've been dragged out of the writing and you are no longer thinking about what the writing is talking about you're thinking about how the words work on the page. The proofreader is the person who can smooth out a lot of those bumps. So to keep you focused on the writing, what the writer is saying and not the writer is putting on the page. Anna: Yes. Yeah. It's those three positions in general, and how they work together and how they connect are so undervalued and unappreciated. You're preaching to the choir here, but I agree and I hope everybody else is on board as well. So Jonathan I- I Think it's often seen as an additional expense though, which is why it's often is can we get this in one person? And even if a person does have all three skillsets, you're usually blind to your own content, which is why you need to have that step back mirror. So yeah, I don't think it's a cost saving. I think it's a false economy. Yeah, totally agree. Yeah, and some, especially those who are just starting out, some small businesses, it does seem like a very added expense, but it is a very worthwhile investment. Jonathan, I could seriously talk to you about content all day long. We are coming to a close here on our episode, but I would love, please tell everybody one, where they can follow you because you are on all of the social media and then two when the launch, or where they should go check out the new CCO magazine. Jonathan: The new CCO will be launching in the beginning of April. I don't want to put a firm date on it because you know that the moment I say that, then I have jinxed the digital team and it won't launch on time, but there will be an email going out from CMI to say it's now here, click through, go and have a look, so if you want to be there on day one to catch the mistakes that made it through our quality control. Then sign up on the Content Marketing Institute website. There is a link there for CCO. As for my social media, I'm most active on Twitter. I'm also most grumpy on Twitter, so take of that what you will, at Kimota. K-I-M-O-T-A. You can also find me on LinkedIn and Facebook under my name, of course. Pretty easy to find, and those are pretty much where you'll find me. I have yet to really succumb to Instagram. Anna: Nice, interesting. 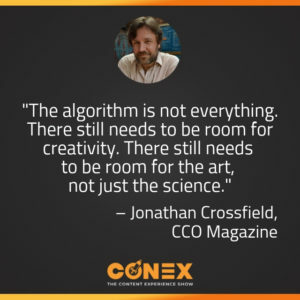 Well, everybody, all right, go follow Jonathan because he is chock full of insights and amazingness and then go check out the new CCO magazine online. Everybody stick around with us for a little bit more though because we've been able to talk to Jonathan about the professional side of him and his career and now we're going to talk a little bit about the personal side and get into some real word nerd stuff so stick around for just a few more minutes and we will be right back. Hey everyone, I wanted to take just a few seconds today to talk to you about Emma. Emma is an email marketing platform that helps you connect with your audience and grow lasting relationships. They're awesome. They offer really intuitive tools to build and automate emails with powerful segmentation and reporting too, and the big difference is they're focused on you between their award winning support and their pro services team. They make sure every customer has success with their email marketing, seriously. They are amazing. You can learn more and request a demo today at myemma.com/jayisawesome. Again, that's myemma.com/jayisawesome. Hey everybody, welcome back. All right, so we're here with Jonathan. As we mentioned, we got to know the professional side of him. Now we're going to get to know the personal side. So Jonathan, of course, being with our writing backgrounds, I have to ask you some literary questions because I so very rarely get to have these conversations with a fellow writer and editor. So just a couple of questions. First and foremost, what was the very first book that absolutely made the biggest impression on you? Like, so there's books that you obviously have to read in school and you know there are books that you just kind of pick up and you're like, oh, that was great, but what was the book that sort of just like blew your mind, or really loved? Jonathan: Wow, that's a big question because there's a number of ways in which books will have impacted me or changed my life. I think the book I'm going to mention is going to be funny in the sense that it's the book that started me off thinking I wanted to be a writer. It started me off with my love of books in the first place, which was the first proper book I ever read. So I was, as a boy, and always have been and still am, a massive Doctor Who nerd. And so the first time I discovered that they had novelizations of the stories, we're way pre-video here. So that was the only way to experience stories you'd never seen. That blew my mind. And I remember reading the first one, I borrowed money from my brother, his pocket money to be able to buy it for 15 p at the news agents. And that was the first book I read end to end that wasn't a comic, at that age I was about six. And that was when I realized ... I fell in love with books. I fell in love with Doctor Who books particularly, because I'd just demolish them from then on. They were my crack cocaine and the writer of those books then, well a lot of them was a guy called Terrence Dicks, in the UK, who has written ... actually I interviewed him three years ago in Australia. He came to Australia to an event, and he had long been on my bucket list for this reason. He's like, if I ever want to interview someone, he's on the list. I interviewed him twice on stage in the same weekend and I'm trying not to nerd out next to him. He has actually written more books than anyone has ever actually been able to count because he's written not only hundreds of books in the Doctor Who range but also in other ranges and all of that sort as well. No one has an exact number for how many books he's written. He has really, really simple unflashy prose. It's very ... you're not going to win literary awards with this stuff. That was not the point. The point me was he got me into reading in the first place and so that was the book that I say has the biggest impact on me. The first one I had read was Revenge of the Cybermen. Anna: Nice. Not to pivot real quick, but there is something to be said for very beautifully written straightforward prose though, and not having to read every sentence that feels like you're walking through tar because it's so heavy and thick with descriptors and just crazy narrative. I agree. I'm a big fan of some straightforward prose. Okay, so would he also then be your favorite author because that would be the next question. Jonathan: I say he's the author who had a massive impact on my life because because of him, I wanted to be a writer from that age. I wouldn't say he's my favorite author because there are other authors, of course, I've discovered since. George Orwell. I am a massive fan of Animal Farm. A massive fan of 1984. His journalism and his articles are stunning. He also has an extremely clear and simple and to the point writing style and his articles on the art of writing are well-worth every content marketer reading. Anna: Nice. All right, so good. All right, last question here. So good one to add to your list everybody. Required reading. Okay, so last question here. What is a book that everybody loves and you just couldn't get into. Jonathan: Oh, oh, oh, crikey. I've got to think about that one. I don't normally think in terms of hating books, you see, so this is hard. Anna: Not hate. We didn't use hate, just maybe something that you're like, ahhh, just, I struggled to get into it. Jonathan: I'm sure there are some on my shelf. Anna: Or a genre? Or maybe a genre? Jonathan: Well, there's many genres I have never even picked up. You won't find me with a Mills and Boone. Books I couldn't get into? That's hard. Anna: That's a stumper. Jonathan It is. I think what I'm going to say is I went through a period of trying to pick up on all the classics, so I've got a lot of the Penguin Classics in the shelf and I went through a stage a few years ago. I need to read the books I haven't read yet. So I read Frankenstein and so on. And Jane Austin left me cold. I cannot, I think it may be to do with they inflicted Mansfield Park on me at school and I couldn't finish it. I found her prose style. I know her ... a lot of people love her prose style. I found it annoying and I think that's just it. Anna: You know what, as writers, we can still appreciate the effort and the beauty of the work that they created, even if we're not massive fans of it. So I agree. Jonathan, thank you so much for joining me today. Sincerely, this was a delight and I got to nerd out, so thank you so much for indulging all of my writing discussions, everybody- Jonathan: And thank you for indulging my long and rambling answers too. Anna: No, they were fantastic. Thank you so much. Everybody else, thank you so much for tuning in. Once again, go ahead and do us a favor. When you listen to this, wherever you listen to it, please leave us a review, leave us some feedback, let us know what other topics you'd like to hear from. Until next time, this is Anna Hrach from Convince & Convert, and I will be joined next time with Randy Frisch from UberFlip.